On New Years Eve, Eclipse Aviation Corporation’s first Eclipse 500 certification flight test aircraft successfully completed two flights in the aircraft’s first day of flight testing. At 10:16 a.m. (MST), aircraft N503EA, powered by two Pratt & Whitney Canada PW610F turbofan engines, took off from Albuquerque International Sunport for its maiden flight, which lasted one hour and 29 minutes. After a thorough inspection by flight test engineers, N503EA was cleared and departed again at 3:59 p.m. for its second flight of the day. That flight lasted 54 minutes. 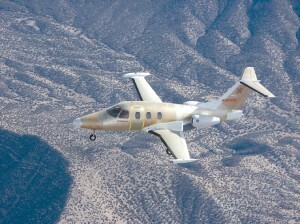 The Eclipse 500 successfully completed all maneuvers in the test area during the flights. Eclipse Aviation president and CEO Vern Raburn congratulated the test pilots, and thanked the Eclipse employees and partners that worked tirelessly to achieve the important milestone. Tests pilots Bill Bubb and Brian Mathy piloted N503EA, climbing the aircraft to 16,800 feet, and reached 200 knots during the first day of flight tests, while completing all scheduled test points to test basic maneuverability and various aircraft systems. N503EA is fully equipped with mechanical systems including pressurization, climate control and ice protection, as well as with the Avio Total Aircraft Integration system. The flights were conducted in a designated test zone located south of Albuquerque, N.M.
Eclipse’s state-of-the-art telemetry and data acquisition system was used to monitor the flights, allowing the collection of more than four gigabytes of data per flight hour. Engineers in a ground station will have the ability to monitor more than 2,000 aircraft parameters in real time, analyzing rich information about systems, structures, aircraft handling and performance. The advanced analytics system, combined with N503EA’s exceptional performance in its first flight, enabled Eclipse to clear the jet for the second flight. Eclipse’s initial aircraft, N500EA, flew for the first time in August 2002, and was subsequently retired in October 2003, after completing a highly successful flight test program. Since then, Eclipse has been manufacturing an additional seven preproduction aircraft: one static test airframe, one fatigue test airframe and five additional flight testing aircraft. The maiden flight of N503EA on December 31 initiated a 15-month testing program that involves seven test airframes, more than 3,000 flight hours and several hundred hours of ground testing. 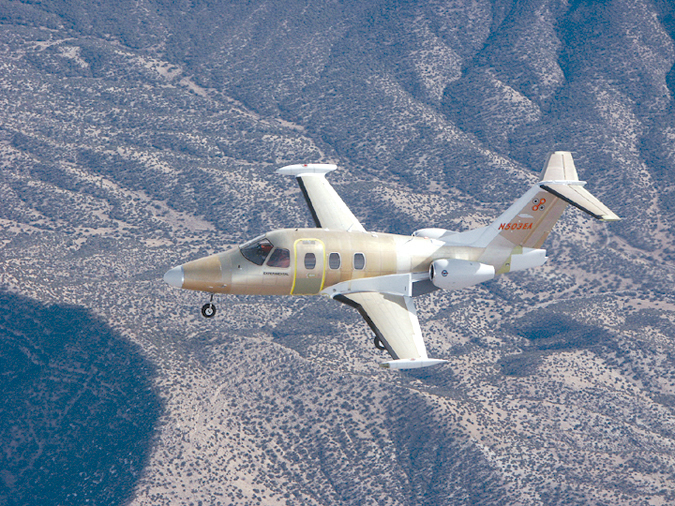 Eclipse estimates that the Eclipse 500 flight test program will accumulate two to three times more total hours than traditional GA aircraft programs, allowing the aircraft to achieve a higher level of reliability prior to first customer deliveries. The flight test program will culminate with FAA certification in March 2006, with first customer deliveries shortly thereafter. el system, landing gear, electrical power distribution system and climate control system. For more information, visit [http://www.eclipseaviation.com/].